You've got good imaginations. These inkblots are a part of a Rorschach test. 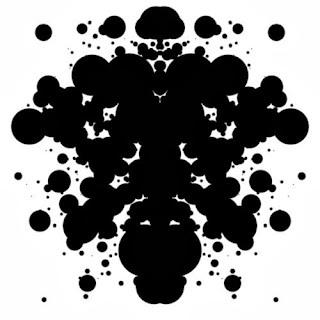 Supposedly a trained psychologist can tell a lot about your personality based on how you describe these inkblots. Perhaps you have taken one of the other personality tests. These are instruments designed to give you an indication of how you are wired as a person. A few years ago I took the Myers-Briggs Type Indicator – which was a very enlightening experience. I found out that I am an INFJ. Since I’m sure you want to know all about me -- The I in INFJ tells me that I'm introverted – but only slightly so. My score is so in the middle that when I took the test a second time it said I was slightly extroverted. The N in INFJ means that I tend to perceive life intuitively– seeing possibilities, relationships, and the meanings of experiences rather than the immediate, real, and practical facts. The other end of the spectrum are the “sensing” people -- those who like to deal only in concrete facts and details -- sure things. F says that I tend to make decisions on a feeling level instead of a thinking level... but again my score is on the line and I often swing into the thinking category -- gravitating toward the objective and critical information. On a whole, though, I "subjectively and personally weigh values of choices and how they matter to others." I'm concerned about how relationships feel. The J in my INFJ says I live by judgment – (not judgmental but judgment) that is, in a "decisive, planned and orderly way." I prefer planned events over spontaneous. Not that I dislike spontaneous. It's just that I tend to enjoy a well planned party slightly more than a spontaneous get-together -- at least that’s what they tell me. Now, I know that most of this psycho-babble is pretty meaningless to most of you – unless of course, you've done the Myers-Briggs type indicator. And if you ever get a chance to do that, it's well worth it – even if you’re not into the Jungian psychology behind it. It’s kinda’ fun. You can actually do a mini test just to introduce the ideas at www.personalitytype.com/quiz.html. Now, I bring the whole thing up because taking this test was a helpful experience. I’m not sure how helpful the inkblot thing really is but the Meyer’s Briggs gave me a point of reference for looking at my life. And this is exactly what St John is doing in 1 John 2:3-11 – laying out a bit of an instrument to give us a point of reference for our lives – albeit on a significantly different level. A test can tell you something about yourself. And John is giving us a test -- a measuring instrument -- to help us see where we stand in relationship to God – who we are, what we’re like. Rorschach tells us about personality disorders. Myers-Briggs tells us about personality types. John tells us about fellowship quotient. Perhaps we could label this section in 1 John as "John's Fellowship Indicator" -- or the "Fellowship Test." You recall from our study these past few weeks that 1 John is a NT book that's about fellowship – the glue that bonds us with God -- the God of light. And we need to relate to him as light, says John. Well, how do we know if we're doing that? How do we know if we're relating to God as we should? Good questions! Well, let me give you a little test here, says the apostle. This is a test that will help you better understand where you stand with the God of light. Now, I know that over the years people have come up with a lot of tests for knowing if you're relating to God in the right way. The false teachers that John is opposing – they were advocating an esoteric experience of religious enlightenment test – that was their litmus test. If you've been enlightened in the right way, they were saying, it doesn't matter what you do with your life or how you live. You could be Osama bin Laden or Adolf Hitler – and it wouldn't matter because what you do is mostly irrelevant to true life in their system. What really matters is that you've had this enlightening religious experience – that experience was the test – the indicator for them. Are you tracking with me? These days there are many other tests floating around. ■ One test that was pretty popular 50 years ago says that you know you're in good with God if you don't play cards, smoke, chew, or go with girls who do. ■ Another version of the test says that you know you're in good with God if you hold a particular political opinion. ■ Another indicator of modern spirituality is the Sincerity Test. (And this is a best-seller in our culture) What you believe or don't believe doesn't really matter. The only thing that matters and truly indicates that you understand God – is that you are sincere and accepting of everyone else who is sincere. Unless they sincerely don't accept you. There are lots of God tests floating around -- some have a kernel of truth at their core. Others are just totally bogus to the core. So John says, "I want to clear this up once and for all. Here are the things that really count when it comes to being in fellowship with God." This is the fellowship test. And he lays out three key indicators. We're only going to touch on two this morning -- the third one comes later on, but here in 1 John 2:3-11 he spells out two tests by which you can know that you are in the light and thus in fellowship with God. SCENARIO: You're in charge of two workers who are assigned to file reports in your office. You carefully explain the system and offer to help if they have any questions. Worker #1 says he understands and that he appreciates how clearly and precisely you've explained the task. However, when you turn your back and return to your own work he proceeds to file in a way that is completely opposite of the way you thought you had taught. Worker #2 says that she thinks she can do it although she admits that she may make a few mistakes. "That's Okay" you say, "just follow the system and it will eventually workout." After you leave she does exactly that. She files reports in the instructed manner. Yes, she makes a few mistakes but they are easily corrected because she is following instructions and there is a method for catching the errors in your system. Which of these workers is in sync with the office and the reality of your company? Worker #1 who says he knows what he's doing, lays on adulation but creatively ends up doing his own thing. OR is it worker #2 who hesitantly moves forward, makes a few mistakes, but follows instructions? How articulate you come across. It's all unimportant if you fail the basic test of obedience. How do we know that we have fellowship with God? We know because we are doing what he wants us to do -- obedience. Now, this doesn't mean that we gain access to God by obeying him. No, we obey him because we have fellowship with him and are thus allowing his Spirit to work in our lives. Obedience is an indicator that we are allowing God free reign in our lives. Nor is this saying that our obedience is perfect. In vs. 5 the apostle says “But if anyone obeys his word, love for God is truly made complete in them.” Some translations: "...is perfected in them..."
This doesn't mean that the person is perfect or that his love for God is perfectly executed rather that the love of God itself is perfect... complete. It attains its goal. It fulfills its mission. It’s really happening. When John says that we know him if we obey his commandments he is talking about that which characterizes our lives. Those, who in their frailty and inadequacy, are giving a serious shot at obeying the commandments – these are the ones whose lives are characterized by obedience. No, you will never be omnipotent, omnipresence, or omniscient -- or omni-anything. You will never be have the awesomeness of the divine -- you can't live like him in that way. But that's not what John is talking about. He's talking about how you approach life -- with the same compassion, mercy, grace, justice. He's talking about extending yourself in sacrifice. He's talking about the kind of love that you share. Which, of course, leads us right into the second test of fellowship. And the second is the TEST OF LOVE. In vs. 3 John introduces the notion that we know God if we obey his commandments. Here in vss. 7-11 he summarizes the commandments. And calls us to be serious about them. He's not writing this stuff to increase his royalties or as an ego trip. He is writing because he deeply loves us and wants us to be encouraged. And he wants us to be walking on the right path. John says, this commandment that I'm writing is very old but it's also very new. You've heard it all before – it's not new, in that sense. But you need to apply it new because you're at a new point in time -- a time when the darkness is beginning to give way to the light. You can't say "I believe in loving my neighbor as myself. I even acted in a loving way once. I remember it well, it was a fall evening in 1978, I stopped and helped and old guy change a tire." No – the obedience, the love, that John is talking about is always new. It's always fresh. It's always looking for a new channel of expression. That's why he can say, "yet I am writing to you a new commandment..."
If your fellowship with God is indeed real. And if it is a part of his new age that is dawning -- the age of light – then it will be working itself out in an ongoing and genuine fashion. Look at vs. 9 -- “Those who claim to be in the light..." or "I am enlightened...."
He's using some of the stock phrases of his opponents here. Again, these people were saying that once you had taken their enlightenment course and gone through the ritual of enlightenment -- then you could do whatever you want. You could go about your own business, ignore the rest of the world, or you could nuke the world -- it doesn't matter because you are enlightened. You're saved and you belong to the new age. Well, sorry guys, this isn't how it works, says John. If these or similar things aren't happening, you aren't enlightened! To the contrary -- you're blind and stuck in the dark, says old and wise St John. that person is passing the test demonstrating true fellowship with God. This isn’t abstract figure out the inkblot stuff. It’s practical and concrete. How are you doing on John's fellowship test? How are you doing with walking the talk? I mean, that's what all of this is about isn't it – WALKING THE TALK? And this is the key point of the message this morning, THOSE IN TRUE FELLOWSHIP WITH THE GOD OF LIGHT ARE THOSE WHO WALK THE TALK. These are those passing the test... These are those who have their story straight... What they say and what they do are consistent. How are you doing with the test of obedience and the test of love? I’m not the judge but I’m guessing that some of you are testing out pretty well. Just like when I took the Myers-Briggs indicator. It was like a light bulb went on. Oh, that's why I do what I do. That's why I like things done orderly. That's why I'm inclined to consider relationships over hard facts. That's the way God created me. IT'S MY PERSONALITY and this test helps me see who I am. "Oh that's why I do what I do. This is why I'm more concerned about helping people in the church out than I am about making a good living. Some of the people in my family think I'm irresponsible and misdirected but it's reassuring to know that it's all really just a byproduct of my relationship with God. What a wonderful relief!" Some of us, though, are really struggling because we're not sure what the tests are telling us. "Yes, there are some signs of love and obedience in my life. But there are also some dark cancerous spots that are really bigger than I thought they were." "I thought I was doing all right. Never missing church – or at least not much. And being decent and nice to the people around me -- but I'm not sure that I would say that my life is characterized by obedience and love. I'm not sure that I'm testing out so well." You're right to be worried. This is a life and death matter. What should you do? Is there some kind of remedial class you should be taking? Or book you should be reading? Or what? The answer is simple but not simplistic. You must decide that you are going to walk with Christ and then just do it. Step out assuming that God will support your weight in it all. If you choose to walk in the light God -- in his grace -- his Holy Spirit steps in and will lead you along the walkway. Now, this doesn't mean it will be easy to follow Christ. Often it's not but if you continue to choose the light over the darkness you will eventually make it. However, it has to be an ongoing decision -- an ongoing choice. You have to want to walk in the light more than anything else in life. And if that desire isn't there, yet, pray that God would place it in your heart. I know that this is risky -- but faith requires risk. And you may have some doubts about your ability to follow through with your ongoing decision to walk the talk -- but you have to move forward anyway. I’m going to read the passage one more time -- this time from the Message paraphrase. Close your eyes -- soak it in. I’m going to read slowly -- receive these words as though God were saying them to you. Anyone who claims to live in God's light and hates a brother or sister is still in the dark. It's the person who loves brother and sister who dwells in God's light and doesn't block the light from others. But whoever hates is still in the dark, stumbles around in the dark, doesn't know which end is up, blinded by the darkness. Let’s pray. Take just a short time and ask the Lord if he might be speaking directly to you this morning -- if his Holy Spirit might be prompting your heart -- then listen. God of light, flood our paths with the brightness of your presence. Illumine those things over which we trip and which become our excuses to slack off and move with less diligence. Forgive us for the tendency to look for and to become enthralled with those things which belong to the darkness, and which we know should have no hold on us. We confess that they have a hold only because we allow them to--and we do so contrary to your will and your guidance. Slow us down and show us what to do so that we aren't overrunning the light you shine for us. And by that light show us the forgiveness and the hope that belongs to us through the life, death, and resurrection of our Savior Jesus Christ. Show us again so that which is old might become new and grant us the grace to follow your way – to the glory of Christ. Amen.